Tesla was a man with many ideas and had over 300 patents to his name upon his death in 1943. His ideas were revolutionary and his work is still being implemented to this day. The Serbian-American engineer and physicist was a brilliant inventor and he was way ahead of his time. He made breakthroughs and established some of the technologies in production, transmission, and application of electric power. Many of us have probably seen this in science class which was used for scientific testing. This tower is made up of coils and capacitors which store and release a charge of energy creating a lighting spark in the air. This creation has transformed the way our lives are today and has helped many engineers understand how to use electricity. 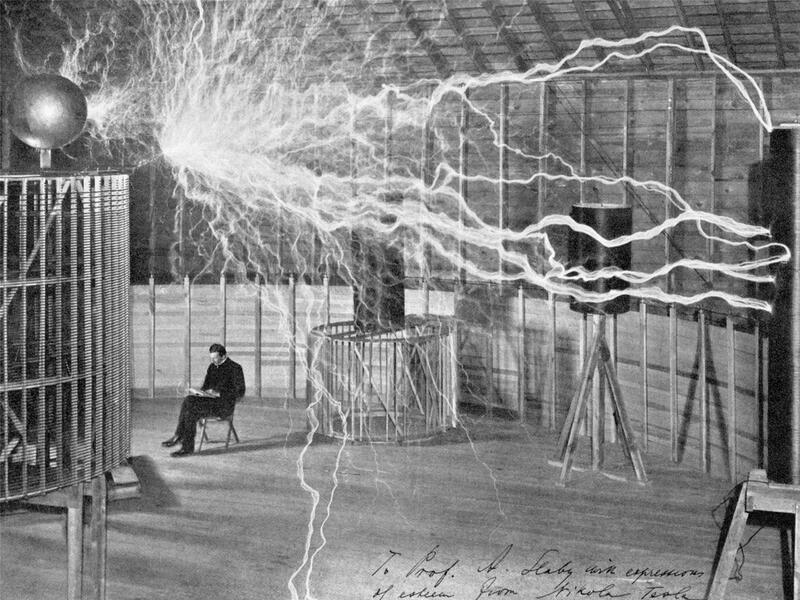 Throughout Tesla’s career, he was obsessed with providing the world with wireless power and he definitely made good use of his work using the Tesla coil towers to transfer the electricity 130 feet away by zapping the other tower with electricity. These magnifying transmitters had the ability to transfer millions of volts of electricity. Because Tesla was a bit too ambitious for his time the financial backers pulled out and left Tesla to file for bankruptcy in 1915 and he ended up with a nervous breakdown. His work for wireless electricity hadn’t been developed until the mid-2010s and even in 2017 it is not common to find this in a household. The piston engine in the automobile industry made Tesla realize that there is room for change in the design and he thought he can create a better version and so he designed the Tesla Turbine that made use of combustion for rotating discs. If you want to know how fuel efficient his engine was it was at 60% and currently, the cars we drive are around is 42% fuel efficient. A man called Rontgen is famous for creating the world’s first x-ray film known as the shadowgraph. However, Tesla claimed he had created this before Rontgen but unfortunately did not have the evidence to prove this as he had lost a lot of his work in a lab fire. What he did do however was take Rontgen’s shadowgraph and dramatically improved the design becoming one of the clearest x-rays ever. Tesla was working on a Radio before his lab was destroyed and was planning on sending a signal 50 miles away. Right before he could rebuild the lab equipment and the radio, the idea had already become patented by an Italian man in England. If Tesla had secured the patent first, his radio would have been much more powerful. Tesla did not invent the neon light or fluorescent light itself but did improve it creating the first neon sign which was presented at the 1893 Chicago world’s fair where he gave a demonstration of his neon light signs! He is great at finding opportunities where further developments in designs can be created and based on existing designs he managed to create four different types of lighting. The Niagara Falls commission had been looking for a company to build a hydroelectric plant. This is when Edison was in competition with Tesla (Westinghouse Electric) and Tesla was offered the contract in 1893. He won the contract due to his demonstration of AC whereas Edison was only able to provide DC. Ferrari have put patents for the induction motor first, however, Tesla had managed to sweep the patents as he had applied for it before even though Galileo Ferrari had presented the design 2 months before Tesla. The motor consists of 2 electromagnets used to spin the motor in the middle and is powered using alternating current. The invention is very influential and is used even today in everyday objects like vacuum, blowdryers and powertools. The teleautomation was a fun and creative invention created by Tesla, however, he failed the patents because the patent office did not believe such as device would work which is when he provided a successful demonstration at the 1898 electrical exhibition. If it weren’t for Tesla then there would not be drones in the way they are today and he provided the roots to Radio Controlled devices. Without a doubt, the biggest impact Tesla made on the world was AC power which he did not even but made it accessible to many people and to be used a lot easier. Because Tesla had provided lighting at the Chicago world’s fair, Westinghouse had decided to purchase Tesla’s patents. In Tesla’s early career he was working for Edison whose company had developed DC and that’s when Tesla developed his advancements in AC.